Perhaps someone slammed their door into your parked car? Maybe a stone kicked up while you were driving and left a scape on the side of your vehicle? In any case, something happened that has you considering getting your car painted. While repainting can be a terrific choice, it’s not always the right choice. Before taking your car in for a repainting, here are 5 things you should know. What you might not realize is that having your car repainted takes time. In most cases, if you’re having your entire car repainted, you can expect to be apart from your vehicle for around a week. Good body shops take their time and make sure their paint jobs have completely cured before turning the vehicle back to the owner. If you’re expecting to have your car repainted for a couple hundred dollars, you’re probably going to be surprised at how much car painting jobs cost. Generally, the minimum that you’ll spend on a paint job is around $500. However, if you’re looking for a high-end paint job, you’ll easily be spending over $1,000. For this reason, you’ll want to consider whether your car still has enough value to justify a new paint job. If your car as a whole can only be sold for $1,500, it’s probably not wise to pay the same price for a new paint job. On the other hand, if your car is relatively new and has low miles, a new paint job can be a very wise investment. For many vehicle owners, a new paint job is seen as a fresh aesthetic start. The only problem with this mindset is that a paint job alone will not perfect the look of your car. 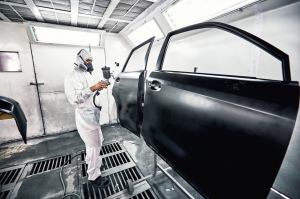 While a new paint job can bring a nice shine to your vehicle, it’s not going to remove any of the wear and tear that the interior of your car has experienced over the years. The point is, it’s better to be realistic about what a new paint job will do for your car; it won’t work miracles. Though paint jobs are only done on the exteriors of vehicles, they still have quite a large effect on the interiors of vehicles as well. This is because, in order to have your car repainted, the interior components of your car need to be removed. Components are removed to avoid any damage that might be done during the painting process. Fortunately, these components will be safely and properly put back into place after they have been taken out. Not all body shops are created equal. Great body work and car painting takes experience. You should look for a company that has many years of experience caring for cars. In addition, be sure to read their on-line reviews to better understand what past customers thought of their experience. Looking for Auto Body Painting Services in Glendale Heights, Illinois? This article is not meant to discourage you from repainting your car. Rather, it’s meant to provide you with an accurate picture of what automobile painting entails. In the vast majority of cases, having your car painted is the right decision. Are you interested in having your car repainted? Looking for car painting services in Glendale Heights, Illinois? If so, Lombard Body & Fender is the company to see.